The Acquisitions Directorate has been busy. 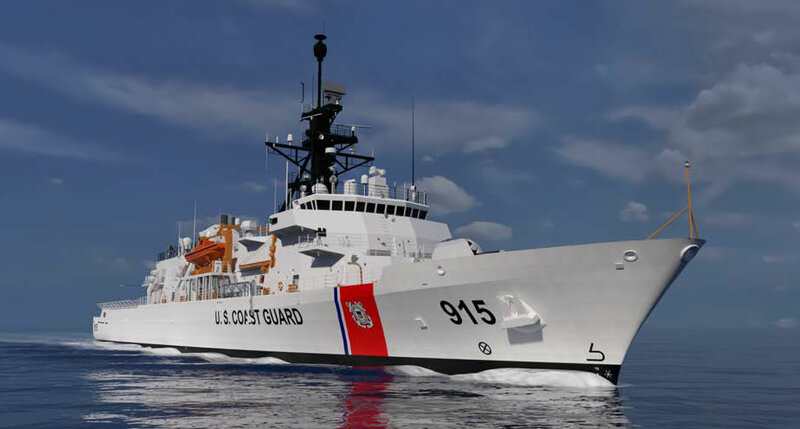 They report exercising a $317.5M contract option for construction of the first Offshore Patrol Cutter (OPC), USCGC Argus, and long lead time items (propeller and steering components, marine diesel engines, the ship integrated control system, switchboards, and generators), for the second OPC, USCGC Chase. Delivery of Argus is expected in 2021. They also report exercising an option for long lead time items for an as yet unnamed eleventh National Security Cutter (NSC). We currently have names for the first nine NSCs. I am hoping we will name one for Commodore Frank H. Newcomb, who was CO of the Cutter Hudson at the Battle of Cardenas Bay. He really should have gotten the Metal of Honor. It would also give us a nice tie into the Navy since they had a heroic destroyer named for Newcomb. I also think Walsh would be a good choice. His Navy Cross citation. This entry was posted in national security cutter, NSC, Offshore Patrol Cutter, OPC, Shipbuilding by Chuck Hill. Bookmark the permalink. Two outstanding choices for names, Chuck. Any rumblings about a possible 12th NSC? The Commandant referenced the possibility of a 12th NSC in his testimony before the House Subcommittee. Right now it is just talk, but HII has a strong lobby and it is seen as fully replacing the 378s. I gotta say: that artist’s impression of the OPC is exhilarating. It definitely has a “Secretary class, meet the 21st Century” kind of feel from that angle. Hopefully the actual ships will feel that way too. When the OPC contract was first awarded to Eastern Shipbuilding Sept. 15, 2016 the cost was quoted at $2,380M for 9 ships, $264.4M each, excluding GFE – total overall cost estimated by USCG at $421M per ship, now Sept 28, 2018 $317.5M contract awarded for build of first ship and funding for the long lead items for second ship, offset out by the earlier Sept. 9, 2017 contact awarded for the long lead items for first ship of $41.68M. Excluding the difference of one years inflation on the long lead items, cost has risen by (317.5-264.4) $53.1M, 20%. There could be various reasons for the 20% increase i.e. first ship of class premium, additional additions by USCG to specs and we do not know contract terms, perhaps original cost was priced on a block buy of the 9 ships. It will be of interest to see if future ship buys the cost comes down to the original cost quoted. Pretty sure, this is just a reflection of the cost of first of class. It is not a new contract. This was the first option included in the original contract. Remember there a a lot of class expenses which are front loaded into the cost of the first ship of build. A better number should be the second hull construction costs plus the $97.1 mil shown above? Glad to see this program moving smoothly thus far! Eastern is really doing a good job keeping to cost and schedule, which is something they were known for commercially. Also good to hear that a 12th NSC may be possible. Fingers crossed!